The universe outside of our own little blue planet has long excited our imagination, so much so that it took us only 66 years to touch down on the moon after we first learned to fly in the first place. Damien Chazelle’s First Man is a film about one of the men who had the courage to make the impossible, possible. From start to finish it celebrates the life of a former soldier turned spaceman. Every single frame of the film is a testament to the ambition, gallantry, and bravery of quite possibly the most iconic spaceman the world has ever known. That man of course is Neil Armstrong…the guy behind that whole “That’s one small step for (a) man, one giant leap for mankind” line which everyone and their brother knows and misquotes by heart. Neil Armstrong was the Commander of the Apollo 11 mission which famously found humans landing on the moon, and First Man is a film that surprisingly focuses much more on Neil Armstrong the man and less on Neil Armstrong the astronaut. That isn’t to say that 90% of the movie involves Armstrong doing mundane chores in his Houston home, because it doesn’t. The film simply focuses less on the heroic accomplishments of space flight and more on the effects that repeated attempts at space flight can have on a man and his family. This is a movie that wants to triumphantly put the audience in the cockpit of a shuttle just as much as it wants to show the audience that Armstrong was a vulnerable human just like the rest of us, and to that extent the film succeeds. The story of the film is quite basic, though it does jump ahead from mission to mission at a pretty brisk pace. This never gives the film too much of a choppy, hastily edited feel because it all blends together well, but it does probably gloss over a lot of things that some historical purists would like to see. For the sake of time however, the film includes pretty much all of the highlights and it never makes the film less engaging. The audience follows Neil during his test flights of the North American X-15 rocket-powered aircraft in 1962 all the way to shortly after returning to Earth following the events of the Apollo 11 mission in 1969. It isn’t autobiographical in the sense that it covers his entire life from birth to death, but it does focus on arguably the most interesting chunk of Armstrong’s life. The film does a good job of grounding Armstrong, played by Ryan Gosling with the sort of reserved stoicism that Armstrong was known for. Gosling rarely shows much emotion throughout the film (staying true to character), but when he does it’s made all the more powerful because of its scarcity. There’s a scene early on in the film that occurs after some truly horrific event in Armstrong’s life which had me sobbing like a baby in the middle of the theater, especially as I watched Ryan Gosling completely and utterly break down because of it. It’s really powerful stuff, and not what I expected at all when I signed on for what I thought was going to be a light and fluffy film about going to space. The rest of the cast does a fine job, but there aren’t a ton of characters given any real sense of development other than Armstrong and his wife Janet. A large portion of the film is spent back on Earth with Janet (played wonderfully by Claire Foy) as she chain-smokes cigarettes nervously by her radio, listening in to the live NASA feed and wondering if her husband is going to survive his latest mission. Their relationship is a complicated one, but ultimately it’s the glue that holds the film together and both actors deliver gripping, human performances that make you understand and pity both characters. The cinematography in the film is both the film’s greatest strength and the film’s greatest weakness. I love a good shaky-cam as much as the next guy (I was one of only 6 people to enjoy the first Cloverfield film, for instance) but the shaky-cam in First Man make Cloverfield seem like it was filmed on a stable tripod using advanced image stabilization technology. All of this shakiness takes place during the extended shuttle launch sequences that last mere minutes apiece, but they feel like they take lifetimes because they’re so hard to watch. I see why it was filmed this way. It was an artistic choice to drive home just how rough something like a shuttle launch can really be for the guys inside. There are creaking metal and jingly bolt sound effects thrown in for good measure, so you honestly feel like this entire thing could just fall apart at any second. It’s almost disturbingly realistic to sit through and it makes you really empathize with the poor lads who are strapped down and have to see it through to the end, for better or worse. I had to look away a few times just to keep my wits about me, and I’d be lying if I said my stomach didn’t feel upset at least a couple of times due to the assault on my senses. It was definitely an interesting experience, and I can honestly say that it’s a first for me as far as movie-watching goes. The movie really puts you in the cockpit and makes you feel all of the astronauts’ fear, uncertainty, and claustrophobia which is an experience as cool as it is uncomfortable. Like sitting in this chair must be. Honestly, I want to recommend this film to everybody. I think that anybody (fidgety children notwithstanding) could sit down and watch this film and be engrossed in one way or another, especially if you find space travel an interesting topic and want to see how man first reached the moon. But I understand it’s not for everybody. If you want more action or comedy in your movies, this probably isn’t going to be for you. This one is a slow burn and focuses intensely on human emotion and drama. If you find shaky cam nauseating or find intense sequences of claustrophobia and sensory overload to be traumatic, then I recommend you skip this one entirely because this film pulls no punches. You will feel like you’re about to fly into space and you will probably feel, however briefly, a sense of discomfort. But for me, that was part of the magic of the film. Getting to experience the inspirational tale of the first man on the moon was just a bonus. Greetings cadets! 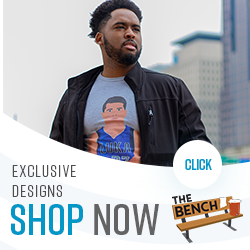 If you enjoyed this content from The Bench Sports, check out our merch store here and pick yourself up a little something!